Ebola panic anniversary: Predictions of a U.S. epidemic didn’t come true. What were the worst predictions a year ago, and did they come true? 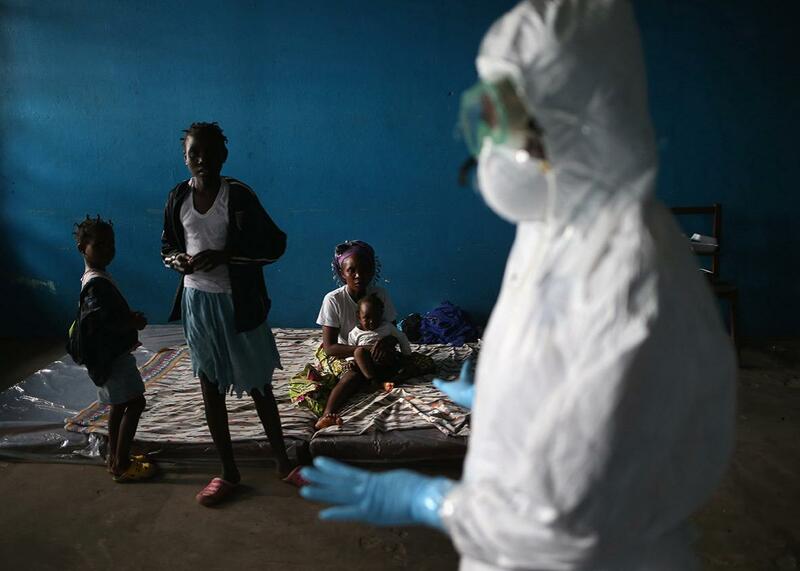 A Liberian health worker speaks with families in a classroom converted into an Ebola isolation ward on Aug. 15, 2014, in Monrovia, Liberia. It’s been a year since peak “Fearbola” in the United States—the out-of-proportion panic at the possibility of Ebola cases in this country. At that time, the outbreak was increasing dramatically in Sierra Leone, Guinea, and Liberia. Thomas Eric Duncan was being treated for his Ebola infection in Dallas, under the care of nurses Amber Vinson and Nina Pham, and he died Oct. 8, 2014. Both nurses later developed the disease themselves, and Vinson traveled to the Akron, Ohio, area during her incubation period. In mid-October, New York City physician Craig Spencer was diagnosed with the virus; shortly thereafter, Kaci Hickox, a nurse working for Doctors Without Borders in Sierra Leone, was forced into quarantine after flying into Newark airport. Politicians and pundits called for the immediate cessation of flights from the affected countries in order to “keep America safe.” Even scientists joined the fear game, suggesting that Ebola might “go airborne.” Schools told children of workers from the Centers for Disease Control and Prevention who had been deployed to Africa to stay home from school. Individuals who had spent time anywhere in Africa (even thousands of miles from the outbreaks) were regarded with suspicion and ordered to self-quarantine. A poll of Americans in mid-October of 2014 showed that two-thirds were concerned about a widespread Ebola outbreak in the U.S.
A year later, none of the panicked predictions have come true. The outbreak has slowed significantly in West Africa. Fewer than 10 new cases per week have been reported since July 2015, and Liberia was declared Ebola-free in early September. The U.S. hasn’t seen an active Ebola case in more than five months, after 10 cases were treated in 2014. Only two of those, nurses Vinson and Pham, were acquired in the U.S. The others were infected elsewhere, with all but Duncan purposely brought to the U.S. for treatment. An additional patient was brought into the U.S. in March 2015 and released in April. He was the sole U.S. Ebola patient in 2015. 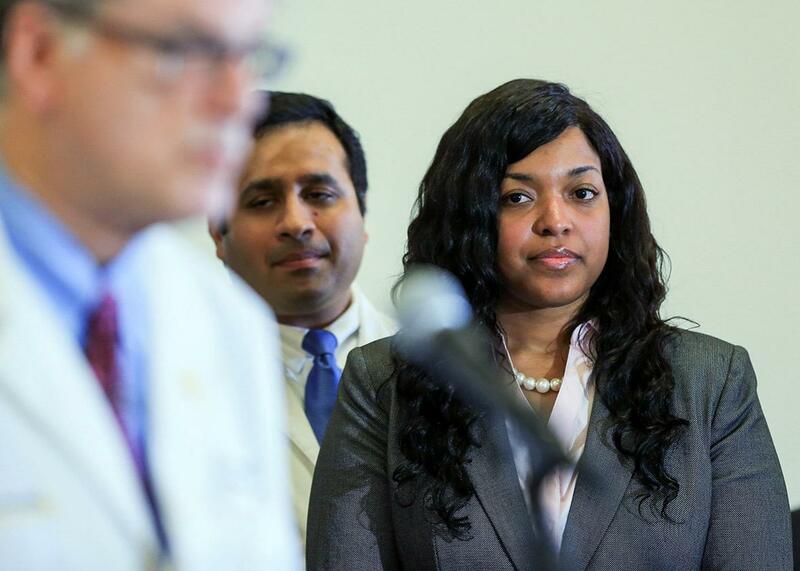 Amber Vinson, a Texas nurse who contracted Ebola after treating an infected patient, listens as Dr. Bruce Ribner speaks to the media during a press conference about Vinson’s release from care at Emory University Hospital on Aug. 1, 2014, in Atlanta. Clearly, the fear of the virus and political posturing ahead of midterm elections led to an Ebola response that was far out of proportion to the actual threat. Now that everyone has calmed down, it’s instructive to look back. What predictions were made, and which ones held up? Because this epidemic was unprecedented, appearing in three countries simultaneously and in highly populated urban areas, predictions of just how bad the outbreak could get ranged widely. One that received quite a bit of attention was the CDC’s report in late September 2014, “Estimating the Future Number of Cases in the Ebola Epidemic: Liberia and Sierra Leone, 2014–2015.” This was splashed across the media as “Ebola cases could reach 1.4 million within four months” and other similar headlines. These predictions were worst-case scenarios, based on an expectation of little change in international assistance or behavior in the affected communities, and they included an estimate that cases reported were underestimated by a factor of 2½. (That is, for every case detected, another 1½ went unrecorded.) At that point in time, infection numbers were doubling about every two to three weeks in Liberia, and every four to five weeks in Guinea and Sierra Leone. As of late September 2015, there have been more than 28,000 cases total. So how were the predictions so far off? The biggest reason was that this magnitude of infection was estimated to occur if things stayed the same as they were. Which they didn’t. Campaigns in all affected countries raised awareness of the virus and its transmission routes, and international aid finally arrived, in the form of money, personnel, and supplies. As the CDC noted in the paper, “As these measures are rapidly implemented and sustained, the higher projections presented in this report become very unlikely.” The authors were right. While there were many sites suggesting the potential for an airborne Ebola virus, the article that probably received the most attention was an op-ed in the New York Times by epidemiologist Michael Osterholm, titled “What We’re Afraid to Say About Ebola.” Osterholm suggested that virologists were “loath to discuss openly but are definitely considering in private” the possibility that “an Ebola virus could mutate to become transmissible through the air.” Because Osterholm is well known in the infectious disease community, his words carried significant weight (though several virologists weighed in to say that such a mutation would be highly unlikely). 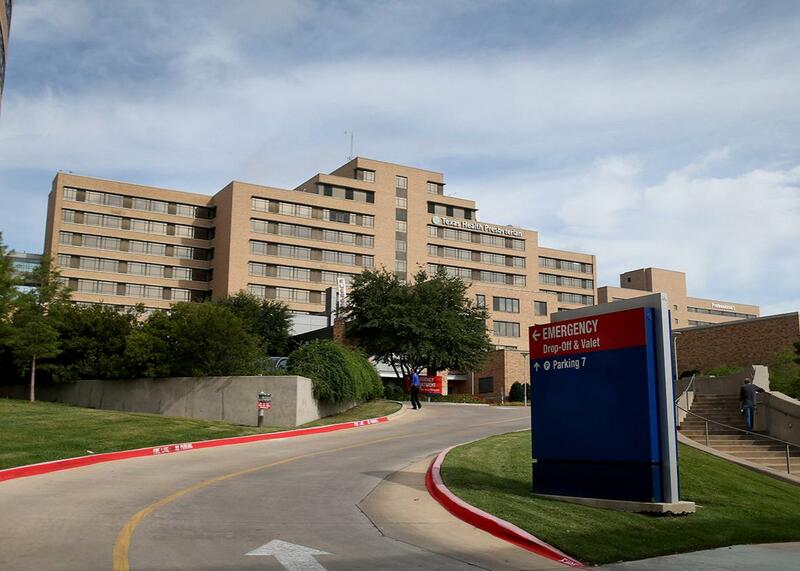 Texas Health Presbyterian Hospital, where Ebola patient Thomas Eric Duncan died on Oct. 8, 2014, in Dallas. Nevertheless, other sites repeated this info, with CNN saying airborne Ebola was “a nightmare that could happen,” and the Daily Mail suggesting airborne Ebola was “very likely;” the Washington Post parroted the question. Pundits were even less reserved, with a Fox News interview suggesting Ebola was “primed to go airborne” and George Will claiming the virus could be spread by a sneeze. Not only has this not happened, studies were published at that time showing that the Ebola virus genome actually is fairly stable and that no evidence could be found suggesting the virus had mutated to become more dangerous or easier to spread. Thomas Eric Duncan arrived in the U.S. on Sept. 20, 2014, to visit his family and fiancée after living in Liberia. He was incubating the virus during his flights and his early days in Dallas. After reporting to Texas Health Presbyterian Hospital on Sept. 25 he was sent home with antibiotics but returned via ambulance on Sept. 28, critically ill. He died there on Oct. 8. The hospital apparently did not follow best practices for control of Ebola infection, resulting in the secondary infections of two nurses. News cameras flew overhead while relatives were moved out of the apartment they had shared with Duncan and emergency personnel decontaminated the area. While incubating the virus, Duncan had contact with 43 people, including close family members, who were monitored for symptoms for 21 days. In that time, he was with his fiancée, sharing a bed, for almost a week. At the hospital, a total of 76 other people were involved in Duncan’s care and likewise monitored for three weeks. Other than the nurses Pham and Vinson, who cared for Duncan while he was at the height of his illness, no one else developed Ebola. 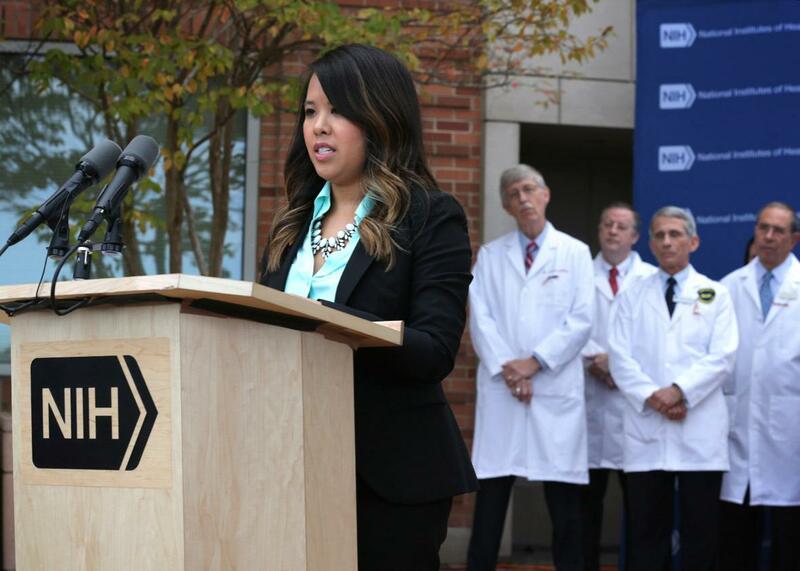 Nina Pham, a nurse who was infected with Ebola from treating patient Thomas Eric Duncan, speaks during a news briefing at the National Institutes of Health on Oct. 24, 2014, in Bethesda, Maryland. Many people complained loudly after the initial Ebola patients, Kent Brantly and Nancy Writebol, arrived in Atlanta for treatment in August 2014, claiming that bringing the patients to the United States endangered the country. The clamoring increased significantly after Duncan was diagnosed and then passed away. Sen. Ted Cruz, currently a Republican presidential candidate, requested that the Federal Aviation Administration make plans to stop allowing flights “to countries that have experienced significant Ebola outbreaks.” Similarly, North Carolina Republican Sen. Thom Tillis demanded that “the White House should immediately ban travel from Liberia, Sierra Leone, and Guinea to contain the spread of Ebola,” and another current GOP presidential hopeful, Donald Trump, took to Twitter to demand: “The U.S. must immediately stop all flights from EBOLA infected countries or the plague will start and spread inside our ‘borders’ ” (emphasis in original). Conservative pundit Bill O’Reilly called it “negligence” that the Obama administration had not implemented a West African visa ban. The World Health Organization and other public health agencies were strongly against such travel restrictions, but what Cruz, Tillis, Trump, and others didn’t seem to realize was that there were no direct flights to the United States from any of the affected countries. Even Duncan had come to the U.S. via Belgium, not directly from Liberia. A flight ban simply was not necessary and would not have worked, and other travel restrictions could have compromised our ability to fight Ebola at home and abroad. The mandatory quarantine of anyone returning to the U.S. from Ebola-affected countries, or who had worked with Ebola patients, was also a big topic around the same time as the travel ban controversy. Nurse Kaci Hickox became the first person ensnared in New Jersey’s hastily instituted quarantine after arriving in Newark from Sierra Leone, held for hours at the airport and then left in an isolation tent outside of the city’s University Hospital. New York Gov. Andrew Cuomo instituted a similar policy initially but walked it back in subsequent days. Travelers were caught in a mishmash of local, state, and federal quarantine policies over the following months. In the end, quarantine made no difference—as public health agencies had argued from the start. Because the Ebola virus is not transmitted until the patient is quite ill, quarantining exposed but healthy individuals made little sense scientifically. For those who claimed “better safe than sorry,” agencies such as the WHO and CDC both noted that such quarantines could (and did) decrease the willingness of people to volunteer where help was needed the most. Both quarantines and the travel ban outcries were little more than political theater. 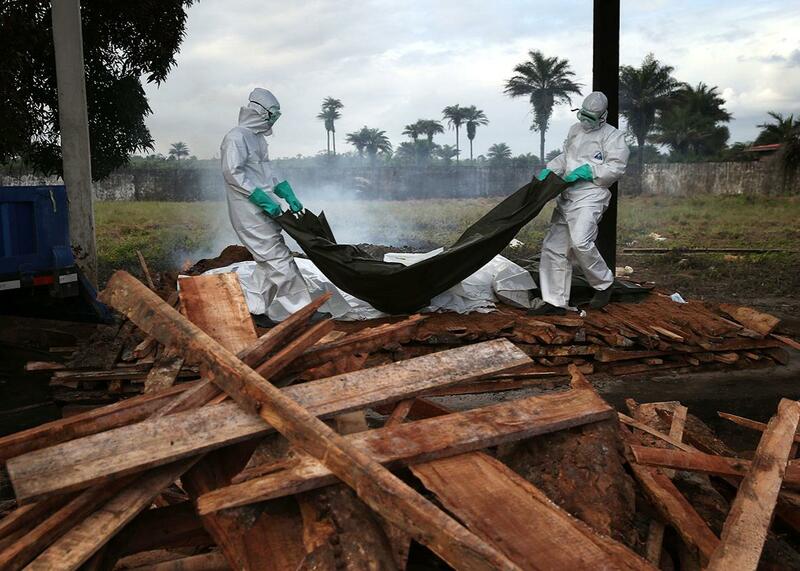 A burial team from the Liberian Ministry of Health unloads the bodies of Ebola victims onto a funeral pyre at a crematorium on Aug. 22, 2014, in Marshall, Liberia. Natural News suggested that Ebola cases in the U.S. were being “covered up,” and meanwhile, you could buy “Family Ultimate Pandemic Protection kits” on its website. “Recommended for prevention response to Ebola virus outbreak,” they could be yours for only $199.95. This site also claimed that nurse Kaci Hickox was “a CDC intelligence operative who has been trained in the art of information warfare,” misrepresenting the purpose of the agency’s renowned Epidemic Intelligence Service training program, which trains epidemiologists to respond to national and international outbreaks of disease. In the end, the United States did not have an Ebola epidemic because of the reasons that were known from the very beginning of the outbreak: Ebola does not spread easily; we have good infection control measures; and we have highly trained hospital personnel and access to personal protective equipment in clinics. While the response in the U.S. was far from perfect and lessons were learned along the way, perhaps the next time the media should give more weight to consensus opinions from leading health organizations rather than a few pundits.